# 33 Place it down the middle of your helmet – mine had holes and I used the tape to cover them. #36 Put more glue over that. #47 From this point on, I’ll need to have my doll hanging from a string in her zipline and harness. I’m placing a clothespin on the line just in case she starts to slide. 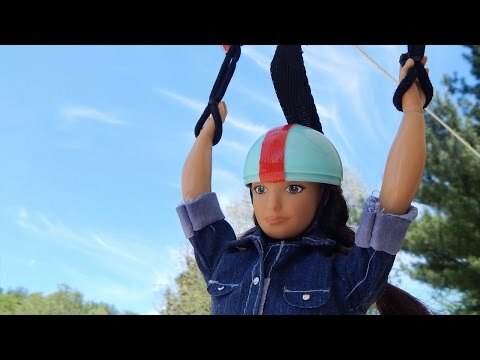 #54 If you’d like to add the camera phone holder to Lammily’s zipline, remove the doll nd the handlebar from the line. Slide a large hair tie around the nylon strap of her harness. #61 Now she’s ready to fly!!! This entry was posted in Lammily TV. Bookmark the permalink.